After spending the night at Drew's Mirror Wall Studio, Jack and Jason headed to San Diego. I called and talked to Drew while they were all at the studio. Their plan for the day was seeing the San Diego Padres play the Philadelphia Phillies at Petco Park. Rhys Hoskins (Jesuit 2011) batted fourth and hit the first two home runs of this major league career. Hoskins' home runs went 402 and 400 feet, respectively. Texting Jack during the game, he said they went crazy when Rhys hit his first home run. 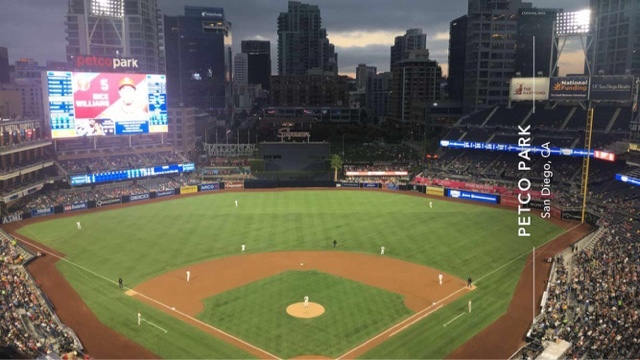 In spite of his two home runs, the Padres beat the Phillies by the score of 7 to 4. They were planning to spend the night at the apartment of a friend in San Diego. Jack and Jason are heading back to Los Angeles on Wednesday to see the Dodgers play the White Sox.